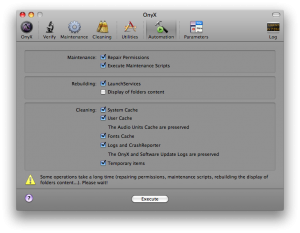 OnyX mac is an all-in-one system maintenance tool and optimizer. It is a very simple and light application that comes with a variety of maintenance tools that can be run to make sure that you are enjoying your system at its fullest. The first scans that OnyX will make automatically when you run the application for the first time are a S.M.A.R.T status check of your hard drives and the analysis of your startup discs. If the application detects any problems, it will prompt you to carry out a reparation task. Not everything that OnyX can do deals with hard drives, though. In the main window, there are five categories. The first one is hard drive analysis and restoration, but the following ones allow you to repair the permissions of your system (a common problem with Macs), clear your browser settings, cache, passwords, etc., delete application, user and system caches, and more. An array of more advanced features is also available. Those allow you to hide or show volumes, repair discs, run custom scripts, among others. OnyX comes with extensive help and it even includes a glossary with the information about many tasks. Although Macs are known for their stability and lack of errors, it can never hurt to have an application like this. It has several different types of checks and repair tasks available. It has lots of help.